I am trying to research a chandelier that I understand was once on the Robert E. Lee steamboat. I have attached several pictures of it and I am hoping that you may know something about it or one of the other experts on your site. 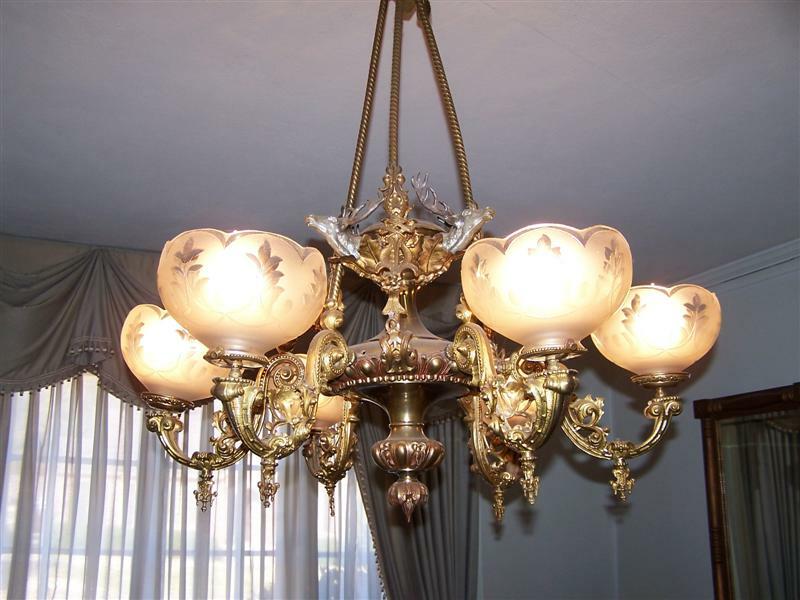 If not, is there a way I can post a question to your readers that may help me get some information as to whether or not this type of chandelier was on the Lee? As far as the chandelier goes, Wikipedia says that there are several Lee chandeliers that are out there: "Three chandeliers originally on the Lee are currently at the First Presbyterian Church of Port Gibson, Mississippi. Another chandelier is in the St. Louis Cathedral in New Orleans. Additional items originally of the Lee are at the Howard Steamboat Museum in Jeffersonville, Indiana" (see original). I was shown an e-mail from you to a website about Mississippi River steamboats concerning a chandelier that you have presumably from the Robert E. Lee. I believe that what you have is from the Lee and I will explain why. In the e-mail you stated that you found out that three of the Lee's chandeliers are hanging in the First Presbyterian Church in Port Gibson, Miss. I can tell you that this is absolutely correct. I was born and raised here and I have been aware of the chandeliers since childhood. The church is quite famous for the chandeliers as well as the gold leaf hand atop the steeple that points toward heaven. The hand is some 18 ft. tall and is set at 95 ft above the ground so you can realize that it can be seen from all over town. The church is located on Church Street, ( US Hwy 61 ) in the center of Port Gibson. There are three chandeliers in the main sanctuary of the church that are unique in that they all have a miniature statue of General Lee mounted on his horse in the center of each one. These chandeliers came from the main deck gentleman's salon located immediately above the boiler deck to the rear of the boat. Now I would like to address your chandelier. There is an Antebellum house that still stands in Port Gibson, known as the "Ellett House" it was built around 1821 and was the home of an attorney named Ellett who wrote the original Confederate Constitution, a draft of which was found during a wallpaper change in 1939 and sent to the UDC Museum in Richmond, Va. When I was a child the lady that owned the home from 1939 until her death in 1973 always had the kids from school taking Mississippi History come and tour the home to see the three story spiral staircase, the copy made of the Confederate Constitution and the Robert E. Lee chandeliers. The chandeliers that hung in the Ellet House were unique in that they did not have the statue of General Lee in the center. When the Lee defeated the Natchez, she was awarded the golden antlers symbolizing the fastest boat on the river. ever since childhood, I can remember the stories told about the Captain of the Lee presenting these two chandeliers to his friend Mr. Ellet when the Lee was finally dismantled. These chandeliers hung in the "Ladies Day Salon" on the Lee and they were hung in both rooms of the double parlor in the Ellett House. In high school our prom pictures were taken in the parlors and the chandeliers can be seen in the background. Unfortunately some things change for the worse. In the late 70's and early 80's a relative of the homes owner attempted to restore the home and add some modern features. During the restoration process he accumulated considerable financial overloads and he was forced to sell of some of the home's original antiques to survive. 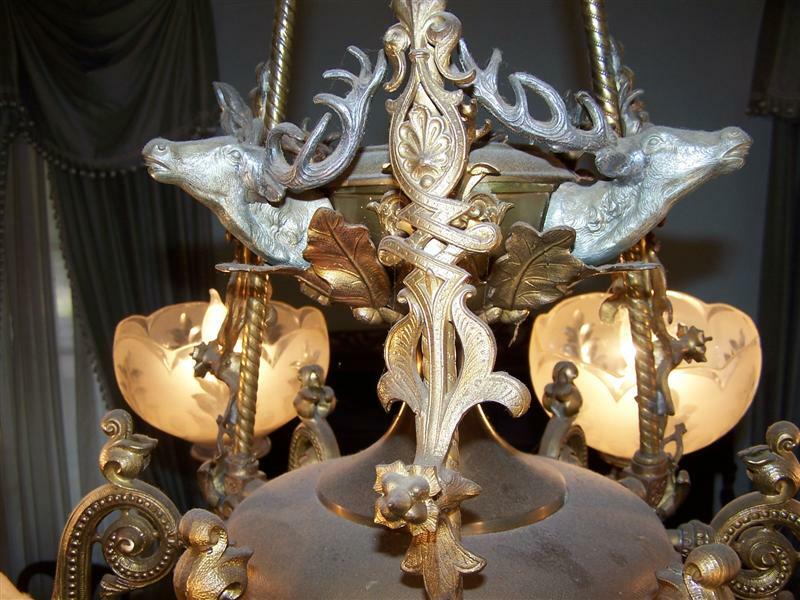 This is why I believe that the picture I saw on the steamboat website is of one of the original Robert E. Lee chandeliers that was sold at auction years ago. A close friend of my family was born and raised in that house and her daughter and I went to school together and have been in the house on many occasions. While I will not disclose their identities here on the Internet, I will be glad to give you contact points that can verify your inquiries. If the chandelier you have is actually one of the originals that hung in the Ellett House I'm sure that documentation of it will be appreciated. Having been born and raised in Port Gibson, Miss. I can verify that chandeliers from the Lee are presently hanging in the Presbyterian Church in Port Gibson. If you are ever in town the church is easily recognizable due an 18 ft. gold leaf hand pointing towards heaven that sits atop the steeple. The church is always open so you could view the chandeliers at almost anytime. These three chandeliers all came from the "Ladies Salon" and are unique in that they have a small statue depicting General Lee mounted on his horse in the center between the globes. 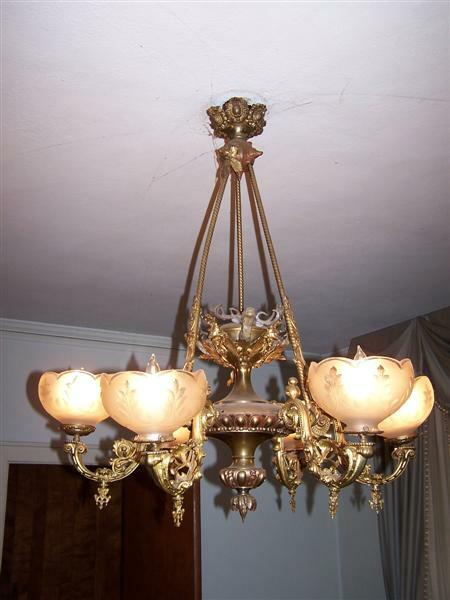 There were two more of the Lee chandeliers in Port Gibson until the early eighties. The one you seek to identify might easily be one of these. Three blocks south of the church and on the west side of Church Street stands what is known as the Ellet House. It was built approx. 1821 and was home to the lawyer that drew up the original Confederate Constitution. The home has other unusual features such as a three story free standing spiral staircase. there are pictures as well as the personal recollections of people living today who can vividly recall the chandeliers. Sometime during the late seventies or early eighties, the house was being restored and the owner became victim of a financial crisis and was forced to auction some of the houses furnishings. The two Lee chandeliers hung in the double parlor on the right side of the hall. Judging from the pictures the chandelier you have could absolutely be a match, because the chandeliers in this house did not have the miniature statue of General Lee as did the ones hanging in the church. I am personally acquainted with several people who lived in the house as children and young adults but I do not feel comfortable putting their information on the internet. 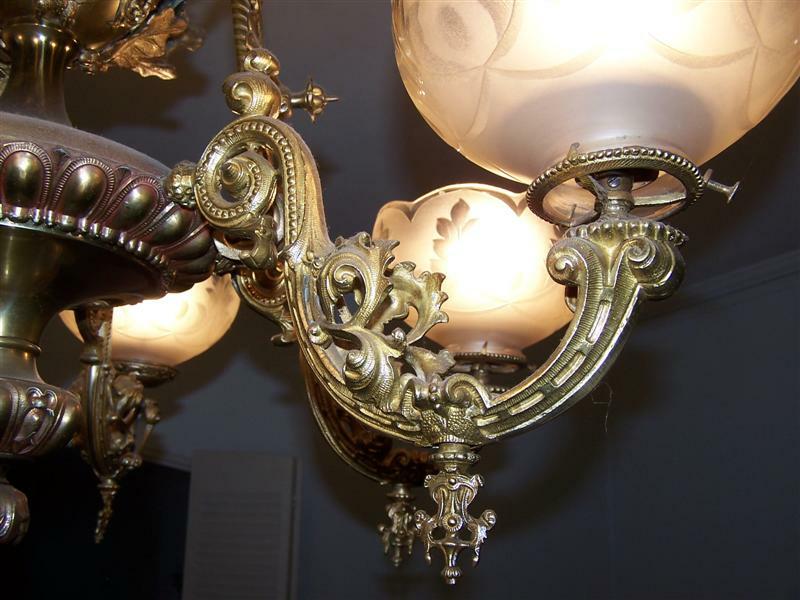 However, if you should wish the Port Gibson Chamber of Commerce at (601) 437-4351 or the First Presbyterian Church of Port Gibson at (601) 437-5428, I am sure you will find people interested in your chandelier and very willing to try and authenticate it.